ST. GEORGE — An event celebrating the families and anyone touched by adoption will offer an opportunity Saturday to see the impact adoption can have on more than 2,500 children living in foster care throughout the state. Adoption can change those children’s lives forever. 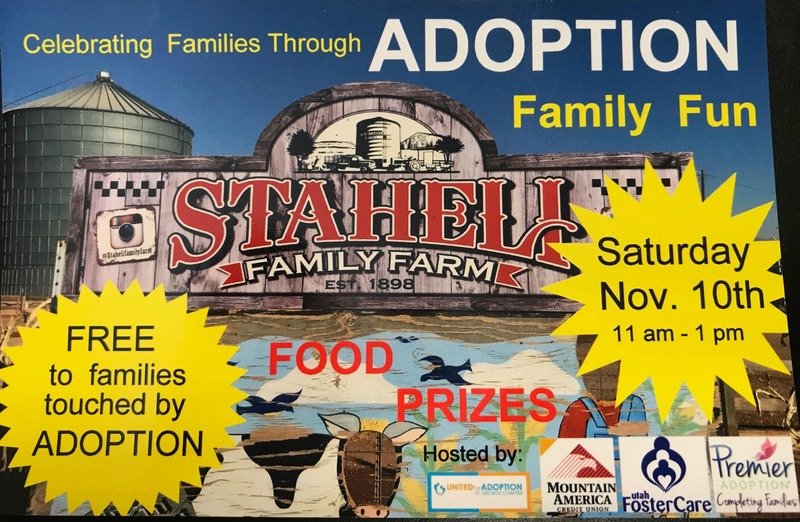 The celebration, suitably timed during National Adoption Month, starts at 11 a.m. at Staheli Family Farm, 3400 S. Washington Fields Road, Washington City. Festivities include children’s activities, door prizes and a light lunch that offers the opportunity to meet and mingle with those whose lives have been touched by adoption. “It’s an opportunity to connect with families, birth parents, adoptees and people considering adoption, and to bring awareness to our wonderful community,” said Ben Ashcraft, southwest region representative for Utah Foster Care said in a prior interview. Many children are born into a home where they are cared for by parents who provide stability and protection; but sadly, that’s not the case for the 2,700 Utah children living in foster care at any given time, living with 1,300 licensed foster care families for an average of 12 months. Most often, children enter the foster system because of abuse, neglect, mental health or addiction problems in their original homes. This free community event is being sponsored by United for Adoption – St. George Chapter, Utah Foster Care, Mountain America Credit Union, Staheli Family Farm and Premier Adoption Agency. Utah Foster Care is a private, nonprofit organization that finds and trains families to provide secure, loving homes for children in foster care throughout the state, and works with other organizations to form a powerful front in the ongoing effort to find permanent homes for foster children who cannot be reunified with their original families. Information will also be available for those considering adopting either privately or through foster care, as well as post-adoption support that is available through community agencies and organizations. For more information visit the Utah Foster Care website or contact Ben Ashcraft at 435-216-3294. What: Celebrating Families Through Adoption. When: Saturday, Nov. 10, from 11 a.m. to 1 p.m.
Where: Staheli Family Farm, 3400 S. Washington Fields Road, Washington City.